Remember the hands-on, time-consuming, mistake-ridden method of analyzing a patient’s food record or diet history by manually calculating nutrient data using a reference guidebook and calculator? In the “old days,” before nutrient analysis software became mainstream, RDs often had trouble precisely tracking their patients’ nutritional intake as well as analyzing the nutrient content of foods and recipes. But thanks to technological advancements, today’s nutrient analysis software has dramatically changed the accessibility of nutrient information and improved the way in which RDs manage their clients’ dietary intake. 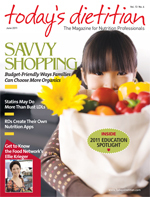 Today’s Dietitian spoke with dietitians who regularly use nutrient analysis software in their practice to determine its biggest advantages and what features allow users to derive the most benefit. According to Debbie Petitpain, MS, RD, LD, a clinical dietitian at the Medical University of South Carolina/Sodexo, the primary advantage of nutrient analysis software is the speed at which nutrition professionals can determine the macro- and micronutrient composition of recipes and meals. In Petitpain’s weight management practice, the greatest advantage of these software programs are the Web- and phone app-based programs for laypersons. Clients can enter daily food records and receive immediate feedback; the programs also provide summary reports for Petitpain. “While the data will not be as accurate as the type of information generated in a clinic or research center, it provides enough information to take my conversation about energy balance with my client to a whole new level, and it helps to empower my client to make better choices by putting one more tool in their toolbox,” Petitpain says. 2. Comprehensive energy estimates: When choosing software, RDs should pay attention to the comprehensive energy estimates it provides. “Assessing a person’s energy requirements—BMR [basal metabolic rate], RMR [resting metabolic rate]—would depend on the formula used by the software,” Larsen says. Does the software use the older Harris-Benedict equation or does it use one of the evidence-based formulas? How is exercise energy expenditure determined? 4. Extensive database: RDs want software that offers a nutrient database that’s large enough so they don’t have to enter new foods, including unique cultural food items. 6. Recipe integration: Software must have the ability to calculate a range of nutrients for each recipe serving as well as detailed information on the nutrient content of each recipe ingredient. Ackerman appreciates the ability to create recipes and generate detailed information, including grams per serving and calories per serving based on the recipe ingredients. 7. Correct portion sizes: The right software may help mitigate the trend toward overconsumption. “I like simple-to-use recipe analysis that can easily show clients that changing the number of servings or portion control can really help control calories and sodium,” Jones says. 8. Reasonably priced: The software should be priced so RDs can afford it for their practice. As Larsen points out, the software package price should include an annual update to the software and nutrient database.